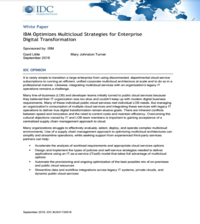 Multicloud strategies have emerged as an important enabler of enterprise digital transformation. Through them, organizations can balance the need for speed and innovation with corporate risk management requirements and spending priorities. Download this IDC report to learn future strategies for successful multicloud deployment and digital transformation, and considerations around IBM cloud management tools and cloud services.